Make Bunting and Have a Party! What are Iain and James doing now? They are making bunting with the help of their friend Adam. It`s sometimes referred to as party flags. Are they planning on having a party then? 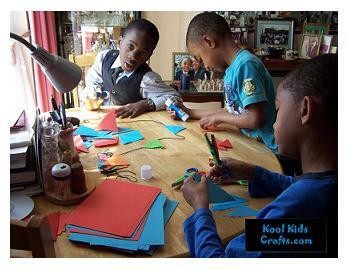 Yes, and they have opted in to make some of the decorations as a paper crafts project. I am going to ask the boys to make some party hats and design the invitations too. I think my Kool Kids Crafts Crew (what a tongue twister) will oblige. Let`s see how they go about creating their party decor. Using lots of colors, glitters, and streamers for kids party crafts will brighten up the decorations for the occasion. We used 4 colors for our project. Blue, green, orange and red paper. We also used 3 paper edger scissors to create different edges on the flags. We needed wool and a glue stick and that was it. You can use string if you prefer. It`s stronger and won`t break so easily, but I like using something that can break if there is an emergency. First fold your paper into 4 (2 folds) which will make 2 flags. If you are using A4 sized paper then fold it into 8 (3 folds) which will make 4 flags. From the right corner of the fold edge, cut to the center of the open edge, turn and cut back along to the other corner of the fold edge. Do it this way if you are right-handed but reverse if you are left handed. You should now have a triangle shape. Open it up and you have 2 separate diamond shapes. If you used A4 paper you should have 4 diamond shapes. Always tidy up as you go. You will find that you have a lot of scrap paper left over from the bunting. Don`t throw it away but store it in a bag for other paper craft projects. Open your diamonds flat and paste some paper glue in the center. You do not need to apply it to the full surface , but enough to stick it around the wool. Now place your wool along the center fold of the diamond and fold it down. Repeat the process with alternating colors and space them at least 5 to 8 cm apart. Now that your bunting is taking shape, you will notice that it`s getting a little tangled so hold the flags together with a clothes peg. You will need a couple of them as they only hold so much at a time. Do you want to get a little more creative? Stick stars and other shiny shapes to make them sparkle. I tried glitter glue but it takes too long to dry. Another idea is to stick some paper streamers in between the flags. Wow! 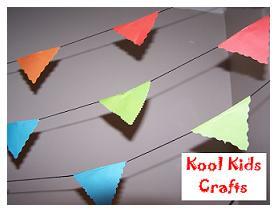 Now you`re ready to party, Kool Kids Crafts style! Making bunting was fun! Click here for more cool paper craft ideas. 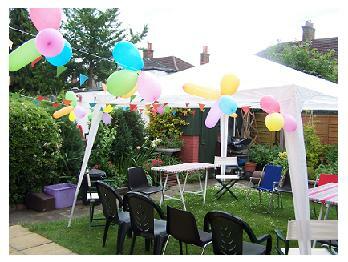 This is the garden, bunting and all ready for the party. We had a great day!